Episode 52 - Daniel Warren Johnson and Space Mullet! This week Daniel Warren Johnson, insanely talented creator of the epic sci-fi webcomic 'Space Mullet' (and nominee for nicest person in comics) joins Vince and Dan to talk about his adventures in creating his webcomic, his amazing Star Wars fanfic comic 'Green Leader' his influences and how he got started in comics. It's a fun episode jam packed with awesome info for comic creators. 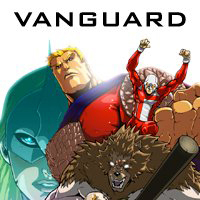 Also as Tony is off on a well deserved vacation, Dan and Vince hold the fort and catch up about their recent comic adventures, including the new Vanguard issue and Cardiff Comic Expo. Also DWJ exposes his comic making facade, Dans makes a controversial statement about a cartoons theme song and Vince talks about some genius insults he recently received. It's an episode not to be missed! And by the power of grey skull, make sure you stick around after the end credits too!